Scott Mason has been travelling North Carolina since 1997, meeting interesting characters, learning riveting stories and discovering delicious food. In this free one-hour program, he’ll take us on a trip to out-of-the-way places across the Tar Heel state and into the lives of memorable characters. He will share thoughtful stories that are poignant, witty, and inspiring, with photography that is beautiful and compelling. Scott Mason is a broadcast journalist with 35 years of television experience. He has won dozens of awards for documentaries, writing, and feature reporting, including three National Edward R. Murrow awards and 20 regional Emmys, and was twice selected as North Carolina Television Reporter of the Year. Scott has worked as a reporter and bureau chief for network affiliates in Chattanooga, Tennessee; Winston-Salem, North Carolina; and Dayton, Ohio. In Richmond, Virginia, his weekly news magazine, Virginia Currents, won more than 100 awards for journalistic excellence. In 1997, he joined WRAL-TV, the NBC affiliate in Raleigh, where he produced ten documentaries before joining the nightly news team. 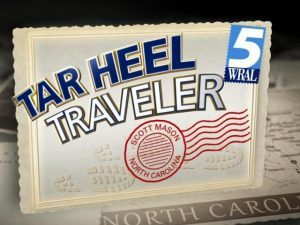 Today, Scott is known as the Tar Heel Traveler. His series takes viewers along the back roads of North Carolina where he meets memorable characters, finds out-of-the-way places, and unearths fascinating historical footnotes. You can see some of his earlier New Bern stories here. Scott has also published three books about his adventures, which will be available for purchase and signing. in partnership with Tryon Palace. The Richard K. Lore lecture is made possible by funding from the North Carolina Humanities Council, a statewide nonprofit and affiliate of the National Endowment for the Humanities.